Baby shower thank you card wording has never been easier! From Activity Seats to Outlet Covers you’ll find all the notes you need on this page! Here’s a list of the notes I have on this page, and you’ll find the notes listed alphabetically below! • Thank you so much for the activity seat for lil . It will surely keep his/her hands busy! We’re very grateful for the gift and look forward to the fun that’ll follow! • Thank you very much for the air purifier for lil ’s room. We’re so very appreciative of the gift and feel much more secure knowing our baby will be breathing cleaner air all on account of your generous gift. Thanks again. • Thank you for the beautiful area rug for ’s room. This gift will add such a wondrous touch to the décor and we’ll always think of you when we see it. Your generosity is greatly appreciated. • Thank you for the gorgeous artwork. It adds a unique and personal touch to the baby’s room. We will think of you fondly whenever we gaze upon it. Thanks again. • Thank you so much for the baby monitor. Now we can feel close to our little one at all times – all on account of your thoughtful gift. We shall cherish it always! Thanks again. • We’d like to extend our warmest thanks for the back sleeper gift for lil . It will be put to good use. Now, we’ll all be able to sleep soundly through the night knowing our lil one is taken care of! Thanks so much for your very thoughtful gift. • Thank you kindly for the beautiful and very useful bassinet you gifted to us. Not only will our little one put this to good use, but it will add such a wonderful touch to each corner of our home! We’ll think of you each time we use it. Thanks again. • I can’t express adequately how blown away we were by the gorgeous Moses basket you gifted to us for Baby . It’s such an elegant gift. It will be cherished for many years to come. Thanks again. • Thank you so much for the handsome basket bedding that you so thoughtfully gifted to us for baby . It will come in handy and Baby will enjoy it thoroughly. Thanks again for your very kind gift. • How did you know we needed a bathtub so badly?! Thank you so much for the wonderful bathtub for lil Baby . Bath time will be that much more special now because of your very thoughtful gift. Thanks again. • Thank you for the bath items for our little bundle of joy. These will surely come in handy in the near future. It was wonderful of you to give such highly-needed items! Thanks again. • Thank you so much for the wonderful assortment of bath toys for Baby . Bath time will be extra special, because of your very gracious gift. We can’t wait to try them out! Thanks again. • and I would like to thank you for the precious bib you gifted us for Baby . We love it and know it will surely come in handy soon enough! Thanks so much for thinking of us during this very special time. • Thank you so much for the snuggly blankets you gifted to us for Baby . We almost want them for ourselves they’re so soft! We thank you for your very thoughtful and warm gift! • Thank you so much for the baby brag book. I’m sure we’ll fill this book up in no time with pictures of lil . This was such a thoughtful gift and we’re so very grateful. Thanks again for thinking of us! • We wanted to send you our warmest thanks for the set of bottles you gifted us for Baby . These bottles will surely be put into action right away! It was very kind of you to think of us during this very special time. Thanks again. • Thanks so much for the handsome bedding set you gifted us for the baby’s room. They really are stunning and we can’t wait to use them! Your thoughtfulness and great taste is so greatly appreciated. • We’d like to extend our warmest thanks to you for the booster chair for our new lil one. This gift will certainly become part of our daily routine, and we’re so appreciative to have one as nice as this. Thanks for thinking of us. • Such precious little booties! Thank you so much for these adorable booties! Not only will we be sure to put them to good use, but we’ll keep them as a special memento of this wonderful time in our lives. We shall look upon them fondly always. • Thank you so much for this wonderful baby bouncer! It will certainly entertain our lil bundle of joy and bring smiles to our faces as well. This gift was just what we were hoping for and you hit it right on the button. Thanks so much for thinking of us. We greatly appreciate it. • What a godsend! Thank you so much for the bottle sterilizer. As you know, this will surely come in handy and it will be put to good use right away. We greatly appreciate your thoughtfulness and will always look upon it fondly. • Thank you so much for the bottle warmers. We so appreciate this very practical gift that we needed so dearly. Baby will surely appreciate it during those night-time feedings. Thanks again for thinking of us. • What a beautiful baby bracelet! and I would like to extend our warmest thanks for the precious piece of jewelry for Baby . It’s really special and we shall cherish it always. Thanks again. • Thank you so much for this much-needed breast pump. This was such a generous gift we are still blown away by your thoughtfulness and generosity. Baby will certainly benefit from this wonderful gift ten-fold. Thanks again. • We wanted to send you a few words to thank you for the precious brush and comb gift set for our sweet lil baby. It was such a thoughtful gesture and we will use it with fond thoughts of you. • Thank you so much for the handy burp clothes (or burp rag) for our new bundle of joy. It will certainly come in handy. Thanks again. • Words cannot express how thankful we are to you for that wonderful baby shower cake! It really took our breath away. Thank you so much for that wonderful gesture. It will remain with us always. • and I are so very thankful to you for the fabulous car seat gift. We are so very happy to know that our baby will have such a wonderful seat to keep (him/her) safe while in the car. Thanks so much for this wonderful gift. It really has touched us deeply. • We’d like to express our thanks to you for the extraordinary car seat and stroller set you gifted to us for the baby. It really means so much to us that words don’t quite sum up what we are feeling. We shall hold your gesture in our hearts for many years to come. Thanks again. • Thank you for the sweet baby carrier gift for our lil bundle of joy! We are so thrilled with it, and look forward to using it daily. Thanks again! • Thanks so much for the much-needed changing pads. We’ll certainly be using them on a daily basis, and so appreciate this thoughtful, practical gift. Thanks again. • We wanted to send you a few words to thank you for the sweet clock for the baby’s room. Now we’ll know what time it is at all times! We’re so very appreciative of this very gracious gift. When we gaze upon it, we shall think of you fondly. • Such precious little clothes! Thank you so much for the adorable baby outfit gifts. We can’t wait to see them on, and we’ll be sure to send you a picture soon of the baby in one! Thank you so much – your thoughtfulness is greatly appreciated. • and I would like to thank you so much for the divine crib gift. We are so very grateful and we can’t express to you enough how much this means to us. You shall always be thought of fondly whenever we place Baby in it. Thanks again. • What a precious gift! Thank you so much for the first curl box gift. This gift shall be held close to our heart for many years to come, and we have you to thank for being able to save such a sentimental memento. Thank you again! • Thank you for these delightful decorations for the baby’s room. They’re so wonderfully festive and really add an incomparable personal touch. Thank you so much for thinking of us during this very special time in our lives. • We can never have too many diapers! Thank you so much for this much-needed gift! We’ll surely put them to good use. Thanks again for your generous and handy gift. • Thank you for the beautiful diaper bag. It’s just the right size and will certainly come in handy when we’re in transit with Baby . Thanks again! • Words cannot express how thankful we are to you for that wonderful baby diaper cake! It was so delicious. Thank you so much for that generous gesture. We shall think about it fondly always. • Just what we needed – somewhere to put the diapers! Thank you so much for giving us this great diaper genie. We’ll certainly put it to good use ASAP! It was very thoughtful of you to think of us. Thanks again. • Thanks so much for the fabulous dish set gift. This is something that will certainly come in handy and is such a lovely gesture that we can look back on for years to come. Thanks again! • The doll is beautiful and elegant, much like the wonderful friend who picked it out. Thank you so much for this precious baby gift. It’ll be a cherished memento during this magical time. Thanks again! • The dollhouse is incredible! Thank you so much for giving our baby such a priceless, fun gift which she will treasure for many years to come. Thanks again. • Thank you so much for the wonderful doorway gate! We so needed this and now we can sleep soundly knowing we have one. Thanks again for your thoughtfulness! • Thank you for the delightful, little dress for the baby! We are overwhelmed by its adorableness, and we can’t wait to try it on her! We shall surely get a ton of pictures out of this outfit. Thanks again. • Thanks so much for the baby dresser. We so needed this gift and you came through for us – we are oh-so-grateful! Thank you for thinking of us during this very special time in our lives. • The DVD is wonderful! Thank you so much for this fabulous DVD for the baby. We’re sure to get many hours of viewing time out of this one. Thanks again for thinking of us. • The engraved gift you sent us was simply incredible! Thank you so much for taking the time to have this done. Words cannot express how special this is to us. We shall cherish it always. • Thanks so much for the very-needed feeding chair for newborns! We were elated to unwrap this and we couldn’t wait to get it out of its wrapping. Thank you for your generosity and thinking of us during this incredible time in our lives. • The flowers were divine. Words cannot express how much they meant to us. They came just at the right moment, and were so appreciated. Thanks again! • Thanks for keeping us organized! The folding bins gift was incredible. Thank you so much for keeping the overall picture in mind – when we’re losing ours! The bins will certainly be heavily used in the not-so-distant future. Thanks again for this wonderful gift. • The furniture was fabulous! We cannot thank you enough for the wonderful baby furniture they you gifted to us. It simply blew our minds. Thanks again for thinking of us during this incredible moment of our lives – your gesture will be remembered fondly always. • and I would like to extend our sincerest thanks for the gift certificate. We’ll surely put to good use soon for our lil one, and we are very touched by your thoughtfulness at this very special time. Thanks again. • The glider chair was such a wonderful surprise! Thank you so much for this very special gift. We shall use it daily with fond thoughts of you. Thanks again! • We’d like to extend our warmest thanks to all of you for the very precious baby gift. It really touched us deeply, and we shall always think back fondly on this day. • Thank you for the sweet little teether. This will surely come in handy with the baby and will great appreciate it as much as we do now. Thanks again! • Thanks so much for the great gymini activity center. We’ve wanted to get one from get-go, and now we have one! The baby will adore this, and we can’t wait to set it up. Thanks again for thinking of us. • Thank you for the much-needed baby clothes hamper. It will look wonderful in the baby’s room, and be such a big help! Thanks again for this very thoughtful gesture. • Hangers! It’s one of those things that will definitely need, but never thought to buy. With the mountains of baby clothes that we are receiving your gift will definitely come in handy. You get extra points for being one of the cleverest gift givers. LOL thanks again. • What a precious little hat! Thank you so much – it will truly be something we not only use, but cherish, for many years to come. Thanks again! • Thank you for the great high chair! We are ecstatic to have one as nice as this and really are thankful to have someone as special as you thinking of us during this very special time. • Hugs to you for the Huggies! Your gift will definitely be put to good use. Thanks so much for your thoughtful and practical gift. • What a beautiful baby ! and I would like to extend our warmest thanks for the precious piece of jewelry for Baby . It’s really special and we shall cherish it always. Thanks again! • What a special gift! Thank you so much for the oh-so-beautiful piece of jewelry you sent to me personally. Words cannot express what this means to me. I shall cherish it for many, many years and look upon this fondly with memories of you and your generosity. • Thank you for the jogging stroller! What a wonderful surprise indeed. Now, I can take a proactive step toward fitness WITH my baby. Your thoughtfulness is appreciated. Thanks again! No baby thank you gift notes currently for K.
• Thank you so much for the fabulous baby lotion gift set. It was very much appreciated, and it smells wonderful. Thanks for thinking of us. • Thank you for the baby massage oil. This will certainly soothe our lil’ one and come in handy! Thanks again for your thoughtfulness. • What fantastic maternity clothes! Thank you for taking the time to pick out some fabulous maternity picks. I really can’t express enough how much this means to me. They will surely come in handy very soon. Thanks again! • This was so needed! Thank you for the thoughtful mattress pad gift. We will put this to good use, and we’re sure the baby will greatly appreciate it as well. Thanks again. • What a nice gift! These shall surely come in handy and save us wear-and-tear on the baby’s mattress. Thanks so much for being so thoughtful. • Thank you for the very special memory book. Your gift will remain with us for many years to come. Thanks again. • Thank you for the fun mobile! It is sure to keep the baby amused for hours. Just like the gift, you are both thoughtful and fun. Thanks again. • Thank you for your generous gift. 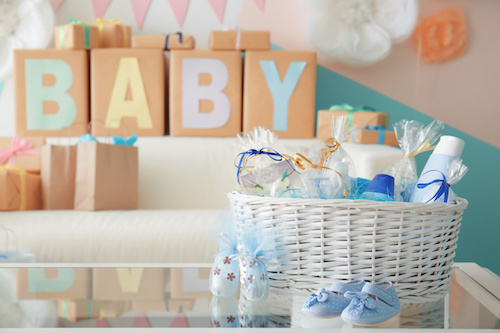 Your gift has been set aside to buy something truly special for baby (insert name). You are a kind and generous friend. Thanks again. • Thank you for your generous christening gift. Your gift is being put toward (redecorating the baby room, set aside for college, or being saved for baby insert name’s future.) Your blessings and generosity are truly appreciated. Thanks again. • Thank you for the gorgeous nightgown you gave me at the baby shower. It’s not only attractive, but comfortable as well. It will help me get some much-needed sleep before the baby arrives. (That is if the hubby doesn’t find me too attractive and it. LOL) you fantastic taste. Thanks again. • The nightgown he gave me for the baby is absolutely adorable. She’ll be cute as a button wearing it. I’ll have to take a picture and send it to you. Thanks again. • Thank you for the nursing wear gift. Your gift means a great deal and will be certainly well utilized in feedings with Baby . Thanks again! • Thank you so for the nursing brassieres. This gift is not something every Mom can definitely use! Your thoughtfulness is very much appreciated. • Thank you for the adorable onesies. The (insert color, design, giraffe, stripes) is/are so cute. The baby will love it! Thanks so much for thinking of us. • Thank you for the delightful, little outfits for the baby! We are overwhelmed by their cuteness and we can’t wait to try it on ! We shall surely get a ton of pictures out of these outfits. Thanks again. • Thank you for thinking of the baby’s safety! Your gift will be put to good use. Thanks again.